Prominent & Leading Manufacturer from Faridabad, we offer aluminium casting parts, aluminum alloy castings and permanent mold aluminum castings. The wide assortment of Aluminium Casting Parts available with us is highly demanded in the marketplace for use in different industries. For augmenting the demand of our castings even more, we have adopted a total quality management approach that persuades us to maintain the quality of our products at par with prescribed industry standards. For the same, we procure the raw material from trusted vendors only. Our clients can avail this range from us at economical prices. 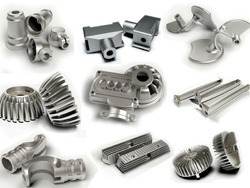 Prominent manufacturer and supplier of Aluminium Alloy Castings, our company has acquired the status of market leader in this domain. Fabricated from topnotch aluminium, these alloy castings have sturdy design and high durability. Furthermore, these alloy castings are engineered with perfection and are pretested in various industry laid parameters. 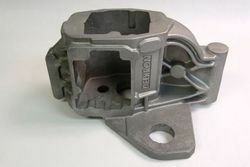 Last but not the least, these aluminium based alloy castings are offered at reasonable prices. Keeping in view the altering and changing desires of our hard-working executives, we are readily instrumental in presenting to our customers a comprehensive variety of Permanent Mold Aluminium Castings. Made up and designed with reliability, these products are broadly cherished due to their optimum strength and seamless finish. In addition, we are shipping these to our clients on time that too in top class packaging. 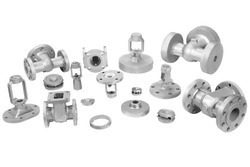 Looking for Aluminium Casting Parts ?